"Community Support: The theme for this year's WBW highlights the importance of helping each mother throughout her breastfeeding journey. Today we are featuring posts that discuss the need for and benefits of a community of breastfeeding supporters. Share your thoughts on and stories about your own breastfeeding journey - was there someone who made your nursing relationship a success? What is access to Lactation Counselors like in your area - did you know where to find them? Were they accessible to you? Did you ever attend a La Leche League meeting or other breastfeeding support group?" It has been a while since I participated in a blog carnival and since this is for World Breastfeeding Week, I definitely gotta join in the fun! Now, as to whether there are anyone who made my nursing relationship success, of course there is! 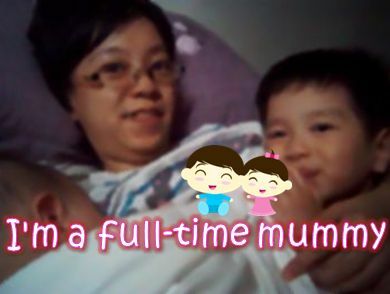 I have been breastfeeding NON-STOP since 4th March 2009, the day my first child Benjamin was born. Breastfed him past 1 year, 2 years, 3 years, then throughout my 2nd pregnancy, then went on to tandem Benjamin and his baby sister Alyson for 1.5 year before he finally self-weaned at 45 months old. * My sister-in-laws: My 3 sister-in laws (hubby's side) all breastfed their children though average between 3 months to the most, less than a year. They do inspired me into going to this journey as well. * My hubby: He stuck by me when I was having my nursing aversion, followed me to the antenatal class where we learned how to care for and breastfeed a baby and how beneficial it is to breastfeed. * My antenatal class trainer: For telling us the benefits of breastfeeding, what to expect, how to handle and so on. * God: Without Him, I won't be here today. My children and family will not be able to reap the benefits of breastfeeding. * My MIL: She helped boiled this black beans and red dates drinks throughout my breastfeeding journey to keep my breastmilk production up. I don't have any LLL support here so during the initial stage, I Googled and read up as many breastfeeding websites I could searched and remembered the tips and tricks and what to expect and hope for the best. How about you? Do you get any support when it comes to breastfeeding?